The purpose behind Bereavement Leave is to help employees emotionally recover before returning to work and offer time needed to handle any arrangements. On average, this time amounts to a few paid days off and may be adjusted based on the relationship between the employee and the deceased. Immediate family—parents, spouse, children, and siblings—warrant up to five days of PTO. Extended family—in-laws, grandparents, uncles, aunts, cousins, nieces, and nephews—may allow three days or less. Though it’s understood why these conditions are defined, it’s also crucial for organizations to be flexible with their policy and offer more paid time off. Susan Bartel, a researcher who studies grieving and loss in the workplace at Maryville University of St. Louis, points out in HR Professionals Magazine that, “Allowing longer bereavement leave gives employees an opportunity to adjust slightly to a new way of life before having to reengage in the world at large”. Organizations willing to treat a vulnerable moment like this with compassion can promote the well-being of employees. Grief can have extensive and lasting effects such as depression, health problems, addiction, and more. It’s important to understand that beyond time off, an employee may need external help navigating their way through complicated emotions. 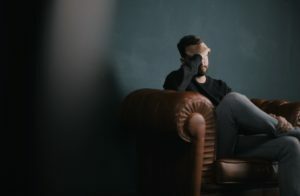 An Employee Assistance Programs, or “EAP”, should be in place as part of your benefits package and you should gently point your employee to the resources it provides, such as professional counselling to help them cope with the changes in their life. 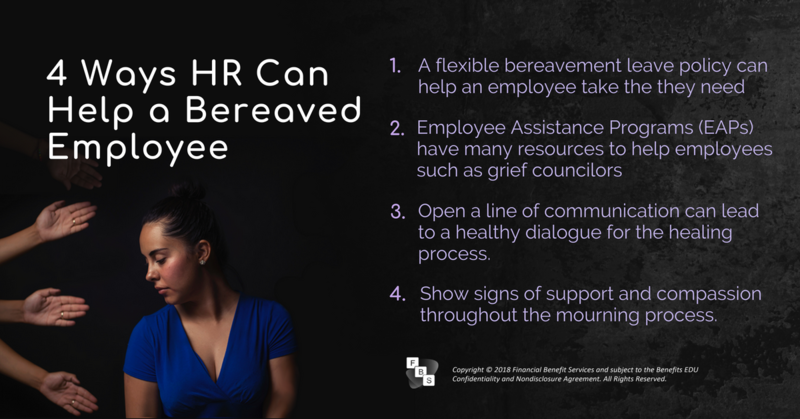 Human resources should contact the bereaved employee to make them aware of policies and services to assist them. Consider that when the employee returns to work, they may not be 100%. Opening a line of communication can lead to healthy dialogue. In the same article as above, Susan Bartel asserts, “If they feel their grief is recognized and understood, they are more likely to contribute to the organization even earlier than they could otherwise”. Scheduling volunteers to bring home-cooked dinners to the bereaved family. For some, returning to work after the death of a loved one is a positive experience because it gives them a sense of stability. While they may seem to be handling the loss well, navigating the chaotic sea of emotions they may be experiencing can be very difficult at times. 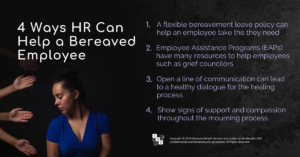 Just like the support they receive from their family and friends, the support and understanding of a grieving employee’s coworkers and employer can be a significant aid in the healing process. If your group would like to explore Employee Assistance Programs or training module options for your management and employees, contact us to speak to a consultant. 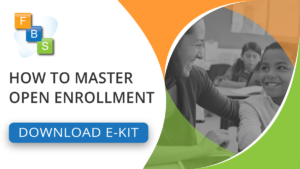 Next The ACA and Affordability – What is this anyway?